I’m at a crossroads. Again. I can’t really see that any path I have taken thus far is actually leading anywhere. I thought the destination was clear. I thought I would take up permanent residence here. Or there. Instead, I have become a reluctant itinerant. Fourteen long years ago I first sensed, heard, felt my calling into – what is still being determined, much to my surprise, frustration, and delight. In the sterile fatigue of a hospital bedside, as I stood watching life slip away from an all too young family member, a gut level voice broke through my weary dullness. Hospital ministry. That was it. Two words and the journey began; the impossible path of trying to understand what it means and how I am supposed to live out those words. It has been a long and winding journey to say the least, one that has been mostly backwards instead of forward. And yet it is a path I would never exchange. My first response was to apply to a chaplain residency program for which I was entirely unqualified. To the surprise of both me and, I believe, the interview panel, I was accepted. It was during that year, among the sickness, death, and hope that something significant was born in me. I experienced the kind of connection to others that transcends race, gender, creed, the many things that categorize us and are all too often used as exclusion criteria. These connections were established within the context of illness and healing, life and death, and were bound by the chords of hope, fear, grief, and joy, all held together in balance by the force of an infinite Love. There’s no time or room in an emergency room, or hospital room, or waiting room for pretense. The connections are quick, intense and brief for a chaplain. I learned very few names but had the privilege of learning from many beautiful hearts. One of the major lessons I learned, and which I continue the need to learn, is that I was not called to “fix” things for people, but instead was called to be with. For a fix it person this is an excruciatingly difficult lesson to learn. But oh so important. I then served as a hospice chaplain, a time in which I had the humbling honor and privilege of being allowed into that sacred role of companion to many as they walked the valley of the shadow of death and grief. It was a holy time in which I further came to appreciate the yearning to be with. The rhythm of saying hello and goodbye gave me a much needed lesson in the necessity of letting go. I had spent a lifetime of holding on in fear of just that, letting go. But I was learning that it is only in the letting go that I could hope to have the openness to truly be present for another. As fulfilling as it was, after a while fatigue and cowardice set in and I drifted back into the abyss, and safety, of the business world for six years. Now, the business world is an essential world in society and I’m certainly not knocking it. My particular job was a safe and certain haven, but it began to drain the very life from me. It simply was not where I belonged. In staying in safety I was scraping against the grain of my soul. At some point the haunting became so strong that I could no longer resist. I once again stepped out in faith, knees shaking all the way. I was hired by a church to do pastoral care while traveling through the long and cumbersome process of education and ordination. The path has pushed me past any limits I could have safely set for myself. Each time I thought I had reached the impossible obstacle (more likely excuse) something, someone would propel me forward and I’d inch on a little further beyond my imagined boundaries. Seminary was the biggest stretch for many reasons, not the least being the challenge of commuting to another city, spending time away from my husband, my anchor, my sense of how I was doing. I will be forever grateful for his patient encouragement to me and his belief that, yes, I was called to do something in response to those two words I heard all those years ago, even if it meant turning our lives upside down. (How can I ever repay that kind of love!) When I left for seminary an old and wise pastor told me not to let seminary taint me or cause me to lose my faith. I believed him. On the first day, the President of the seminary preached in a sermon that we would be turned upside down and everything shaken out in order for us to have the opportunity to put faith back together again in a way that would be ours to claim. I now see this for the word of exhortation and encouragement that it was. Back then I only saw the danger that was threatening my deeply embedded rules of engagement. I would get up at 4:30am to make the drive to Austin and clinch my fingers on the steering wheel, while clinching my mind and heart even tighter. This was just supposed to be about the credentials. This was not supposed to mess with my mind or my heart. Thankfully both were totally messed with. A bit of reluctant transformation happened along the way. That spark that had ignited in my time as a chaplain was beginning to take flame as I realized God’s love is much more expansive than I had ever considered before and that the connectedness of humanity is more essential to the message of Jesus than I had ever realized. Upon ordination I thought I had arrived! I loved the people of the church I was called to serve and thought that all the journey thus far had been to equip and credential me for this one happily ever destination. But it was not to be so. Things had changed. I had changed and no longer fit the role I had been prepared for. After a year and a half I left to take an interim position for a small church. And, now, not quite a year and a half later the interim work is done and it’s time to go. Only to what is uncertain. As of this moment there is no concrete next thing. Which both terrifies me and excites me. Terrifies me because, well, I mean, isn’t it obvious?! Where am I going? What’s the next destination? And yet, excitement hovers over me like a brooding spirit because, while uncertainty might feed my urge to fear, uncertainty holds within it the gift of possibility. And the gift of possibility holds within it; creation, dreams, imagination, hope. In truth, I suppose I’m back where I started. Back when I heard those two little words and I trusted. Not in the certainty of a destination, but rather a knee wobbling trust in a Love that breaks through barriers and promises to be with on the journey regardless where It leads me. My guess is it’s never been about the destination. Maybe it’s been about the opportunity to learn along the way. To learn to stretch my mind and heart further than I thought possible. To learn to grow and to learn that growth has its price. To learn to participate. To learn grace from the inside out. Hmmm, lessons learned, yet so many more to learn. The possibilities are endless! This entry was posted in Faith, Lessons Learned, Life, Uncategorized and tagged connectedness, journey, lessons learned, life, ministry, path, uncertainty. Bookmark the permalink. I love that , Janet. Thank you so much for sharing! I love that too, Janet! Jane, you will be successful at anything you decide to do! Good luck! Keep us posted! Thanks, Ann! And thanks for reading my post! Hope all is well with you. We’re long overdue for a visit! Jane — Your photo struck me like a lightning bolt — and your words confirmed that first impression! 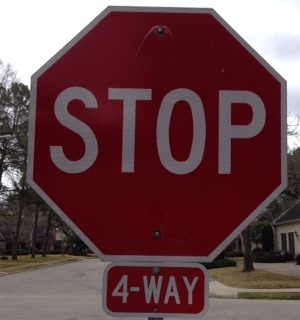 The familiar STOP — with the smaller “4-WAY” beneath… reminded me of the cross-point of the horizontal and vertical axes, where faith and belief intersect. Not a comfortable spot, yet it’s where your words describe you standing – and (I believe) where we are all called to stand though most of us shrink from the fear and pain it creates that you so eloquently describe and share with us. Thank you, Jane – your honesty, strength and love hold me up as well! Thank you, Lisa! As always, your insight is spot on. Much love!